This specification includes medium voltage cables, and accessories for systems rated above 2001 volts to 15,000 volts. All medium voltage cables installed and existing cables spliced to the new cables shall be tested as follows, using D.C. hi-potential. (Note: This is not a grounding or switching procedure; see outage procedure for grounding and switching sequence). Field Testing of New Cables After Installation: The cable shall be tested according to 1.01A after installation and installation of stress relief devices as in 1.01A. Both ends of the cable shall be isolated from air break switches, transformers, etc. Remove all grounds from cable to be “hi-potted”. Note: If conductors are left connected to the equipment, the hi-pot test shall not exceed the rating of the equipment. 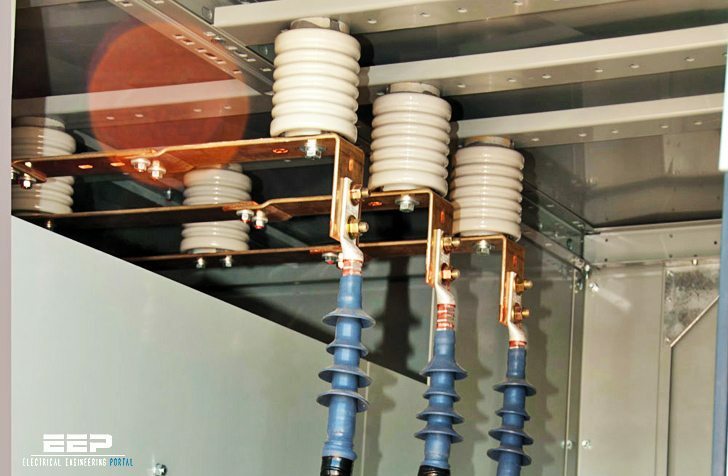 For cables terminated with a 200 Amp elbow connector, elbows shall be placed on an insulated parking bushing prior to test. For cables terminated with a 600 Amp T-splice connector, the T-splice shall be capped prior to test.